As I mentioned in my post yesterday, this is Random Acts of Kindness week. Reading about 10 Kindness Ideas To Do With Your Kids, I started to think about the connection between kindness and good manners. Just last week, I experienced two random acts of kindness in Mumbai’s busy airport. A lady rushed to help Jose pick up some money that spilled out of his pocket, when he was getting his wallet out. Simple good manners, I think, but also a kindness which is a little rare to see these days. And as I was boarding the flight, I asked the guy at the back of me to go ahead of me, because I would take time to lug my bag up. Instead of rushing ahead, he offered to carry my bag for me! I was so pleasantly surprised. I turned down his offer, but his simple gesture of kindness touched me. Though I applaud kindness and share plenty of dramatic stories of kindness which are truly inspiring, I value even more the simple acts of thoughtfulness that we can do for one another on a day to day basis. And I’m beginning to see that good manners and courtesies are nothing but acts of kindness. While I am all for the Random Acts of Kindness movement, I’m wondering if we’re forgetting to practice and teach our children good manners? What happened to the simple courtesies of saying ‘excuse me’ when you bump into someone, saying ‘please’ when you need something, and ‘thank you’ when you receive something? What makes it okay for us to make negative comments to someone like ‘Gosh, you’ve put on so much weight!’ or ‘Have you stopped eating? You’re withering away?’ ? What makes us jump into conversations and interrupt other people to tell our story or make our point? Why do I see people not offering a seat on public transport to someone who visibly needs it more than them? Why do we jump queues, cut people in traffic and generally act as if we’re the most busy people in the world? What makes it nice to keep texting or talking on our phones while we’re supposedly socializing with others in person? This week, let’s pledge ourselves to kindness, good manners and extending simple courtesies to others. 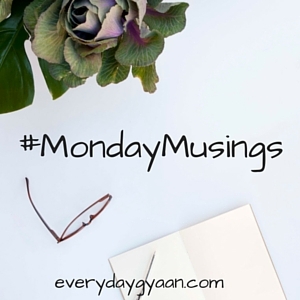 I’m co-hosting #MondayMusings with Richa who writes at The Philosopher’s Stone. Some days it feels,like so much work to teach my children to think of others…and then other days I see them being kind…and I know they’re learning. I’m guessing it’s getting harder to teach this, and yet, children learn from example. My husband and I are working really hard to make sure our kids have good manners. We want them to be kind people. We need more of that in this world! The world can definitely do with a lot more kindess, Stacey! Well said. There is often a greater recognition these days for one off big gestures of kindness, but I agree that the small courtesies, done daily, can have at least as much impact. The big gestures can be good to bring focus and awareness to issues, but the small acts of kindness are more important for day to day living. Isn’t it sad how “common courtesy” is no longer all that common. This is a lovely reflection on how small acts, small words, small gestures can have such a large impact on and ripple outward to the rest of rest world. Keep spreading the word! Although it seems sometimes that good manners and kindness are forgotten skills in our modern society, there are many, many stories of people going out of their way to do nice things for others. Thanks for the reminder! I love the small stories. The every day efforts are important. I seem to be able to manage them all except the thank you note. I’m hoping that is made up for by my general interest and engagement and true appreciation that I show. This is a great reminder. I so agree on the fact that children today aren’t being taught the common courtesies. But I know too many adults my age who do not say thank you. Or I’m sorry. Good post today. I love this – we were just talking about this the other day as nobody offered a pregnant woman on the tram. I have a story I always share… I was 8 months pregnant and taking a short flight with carry-on luggage. I was struggling to lift the bag into the overhead compartment and so set it down to take a breath and try again. A man walked over (I assumed to help me), and as I began to smile and thank him, he nudged me over and filled the empty compartment space with his bag instead!! I didn’t know what to say, but that always pops to mind when talking about simple kindness – what NOT to do! Every word of this is so true Corinne – courtesy and good manners are becoming rarer – which is why we are pleasantly surprised when someone behaves politely – we think they’re being kind or generous, when in fact they are just behaving in the way we all should. I completely agree that we need to be raising children with these values as part of their character so it isn’t lost to the next generation. You write such amazing post Corrine :-). Love to read it over and over . Didn’t know that this was Random Acts of Kindness day. good to know, I try to do this sort of thing often, to connect me to others. And to get out of my own head! I agree, wish we could return to some of the common courtesies! Wonderful post! 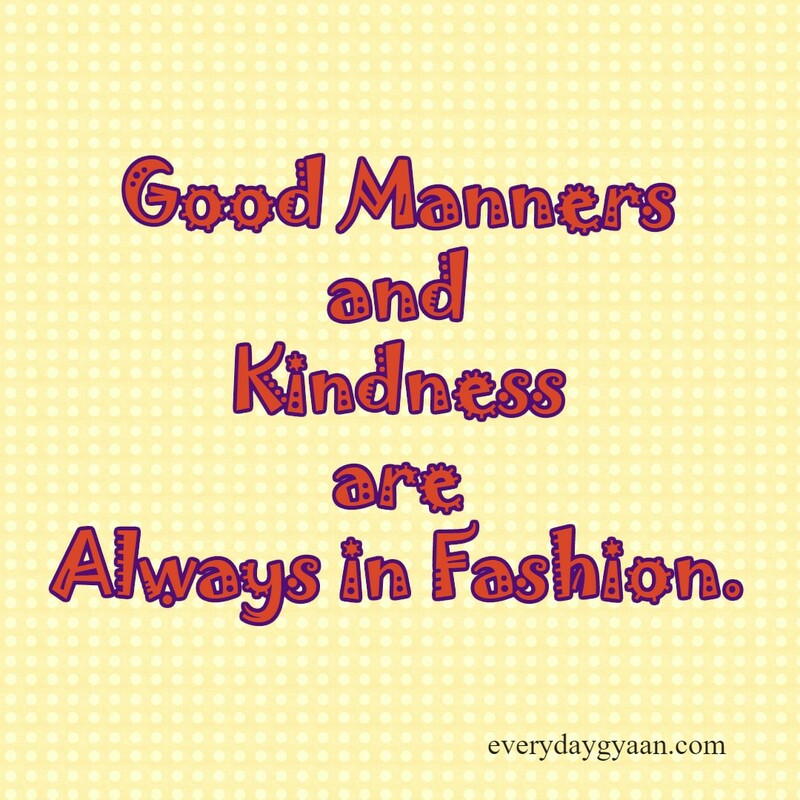 My parents taught us good manners and how to be kind to others. They are lessons that have remained with me. I do get annoyed when others are not as kind or display manners. It seems to be a lost cause on many these days. Everyone’s so plugged in or self-centered. A real shame. Have a great week! I’m at a weird stage of my life… I am getting called out by everyone – seniors, my peers and even my juniors for being too nice and often bending over backwards. And yet, even though I know they mean well and I have been victimized for this, I know it is too late for this dog to change. I have a personal incident to share on kindness. I had landed on Manchester Airport in March 2013 and after going through the immigration checks I was at the baggage claim counter. Now, at Manchester Airport you can only get a trolley on inserting a One pound coin. I had notes of tens and twenties with me. I knew the trolley ejecting machine did not give out change and the procedure of retrieving the change from the airport office was a tedious task.. I was still deciding whether to put it the 10 pound note and loose 9 pounds. Just then, a fellow passenger came to me and handed me a one pound coin to get the trolley. I thanked him from the bottom of my heart. I do not remember that person’s face but I can never forget his kindness. Kindness is always heart warming. Kindness costs nothing yet it’s worth more than a million !!! Kindness is definitely around. Last week my mother-in-law slipped on the footpath and fell down on all fours with a bag in hand. But immediately some schoolboy rushed to help her get up and gather her stuff. We cannot be around all the time, but lets first practice kindness at home. Kindness will definitely get around. I’m guilty of using the phone when I’m with people..Sometimes, it’s so bad almost like an addiction..I’m trying to not do that anymore because I know I feel bad when people do that when I’m around…But you are right, these day we have forgotten almost unlearned the small acts that made us wonderful and kind individuals.